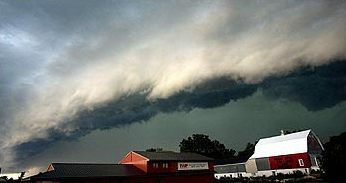 Something called a "derecho" -- a fast-moving line of thunderstorms -- strikes the Washington area, knocking out power for days. Massive forest fires ravage Colorado. A record heat wave covers much of the country. The U.S. press treats these events as major stories, but two words are rarely mentioned: "global warming." What has become most striking about the growing evidence that climate change is a clear and present danger -- indeed an emerging existential threat -- is the simultaneous failure of the U.S. news media to deal seriously with the issue, another sign of how the Right can intimidate the mainstream into going silent. We have seen this pattern before, as the Right sets the media agenda by bullying those who threaten its ideological interests. Before the Iraq War, anyone who dared raise questions about the Bush administration's justifications could expect to be marginalized or worse. Just ask Phil Donahue, Scott Ritter and the Dixie Chicks. During Ronald Reagan's presidency, his hard-nosed propagandists dubbed this tactic "controversializing," that is, anyone who got too much in the way could expect to be subjected to systematic smears and professional deconstruction. With so many right-wing voices willing to say almost anything, it wasn't hard to intimidate people. Indeed, those journalists who wouldn't be scared off could easily be discredited as "causists," or people "with an agenda," i.e., they'd be painted as "unprofessional." So, under this view of "journalism," it's much more "professional" to treat the recent weather events arising from this over-heating planet as unfathomable "acts of God." And that's exactly what we've seen. Though there are exceptions here and there, generally these heat-related weather anomalies have been handled like earthquakes, something that couldn't be expected or stopped. There have been loads of human-interest stories about people coping or suffering but almost no larger context. This phenomenon of silence -- both in the political and journalistic realms -- has not gone completely unnoticed. It's just that those who make the point are ignored, too. "In the United States, a calculated campaign of disinformation has steadily beaten back the consensus momentum for action on climate change and replaced it with timidity by proponents in the face of millions of dollars of phony, contrived 'talking points,' illogical and wholly unscientific propositions and a general scorn for the truth wrapped in false threats about job loss and taxes. "Yet today, the naysayers escape all accountability to the truth. The media hardly murmurs when a candidate for President of the United States in 2012 [a reference to Mitt Romney] can walk away from previously held positions to announce that the evidence is not yet there about the impact of greenhouse gases on climate. "The truth is, scientists have known since the 1800s that carbon dioxide and other greenhouse gases trap heat in our atmosphere. With the right amount of these gases, the Earth is a hospitable place for us to live. But if you add too much, which is what we're doing right now, at a record pace, temperatures inevitably rise to record-setting levels. It's not rocket science. "Every major national science academy in the world has reported that global warming is real. ... Facts that beg for an unprecedented public response are met with unsubstantiated, even totally contradicted denial. And those who deny have never, ever met their de minimus responsibility to provide some scientific answer to what, if not human behavior, is causing the increase in greenhouse gas particulates and how, if not by curbing greenhouse gases, we will address this crisis."